Miranda's Mumbles, Murmurs and Mutterings: Miranda Hart - Is It Just Me? 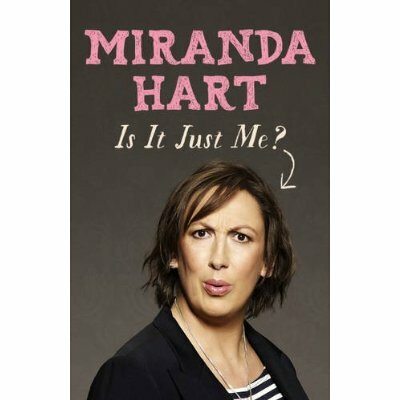 This time last week - I had the enormous honour of hearing Miranda Hart speak live to a small audience in London's West End about her new book "Is It Just Me?" Miranda discussed her book with Emma Kennedy and the the audience were also given the chance to ask questions. It was such an entertaining evening. You couldn't emerge from the theatre without smiling from ear to ear. In fact, I smiled all the way home and even found it hard to get to sleep..! I have found it very hard to put the book down ever since I got my copy last Monday night - my ticket included a signed copy. I sat on the train on Thursday shaking with laughter, snorting into my scarf - every single page has made me howl with laughter and that is no exaggeration. What I absolutely love about her is that she is so incredibly talented and almost implausibly humble, which makes her the best kind of celebrity and virtually unique. She is just so normal and down to earth. Not many celebrities are like that. Add it to your Christmas list this year or order it now if you can't wait until then. I can't recommend it more highly.